I admit it—I’m nosy. I’ve always been fascinated by people’s habits and personal spaces, and what they reveal. There are things we all do: eat and sleep, for example. But the various rituals surrounding these activities and how we define the spaces for partaking in them can be telling. I use conceptual portraits to capture the moments and qualities that bind us together as humans and, at the same time, display our uniqueness. Weeknight Dinners is a series of photographs focusing on typical weeknight meals at home, when concerns about where and what we eat are sometimes swept away by the demands of a busy workday. While photographing new subjects for Weeknight Dinners over the past year, I revisited some of the same subjects from an earlier project, The Bedroom (2008–2012), to examine how habits and environments can change over time. 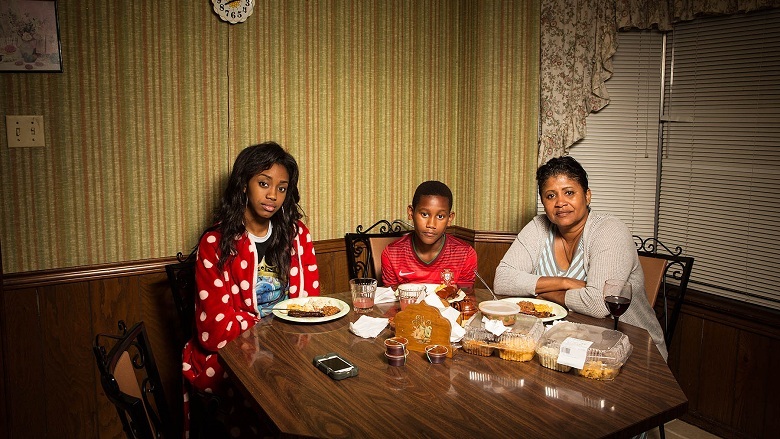 The Weeknight Dinners series currently has 47 images and is on view at The Museum of Contemporary Photography in Chicago as a part of The Midwest Photographers Project. I first showed the work fairly early into the composition of the series at INOVA in Milwaukee as part of the Mary L. Nohl Fellowship Exhibition. This September many of the overlapping images from both series’ will be displayed for the first time in Room&Board: Weeknight Dinners and The Bedroom at ArtStart in Rhinelander. I’m also composing a body of work that will include video, audio, installation, and photography called Androgyny, which will open at UW–Parkside in November 2014. I can be reached through The Portrait Society Gallery or my website, loisbielefeld.com, which includes information about other projects as well as the trailer to my recently released documentary film, Ladies Out.